Deck ideas - A truly simple deck design that is cheap to build yet it does everything that it's owner requires of it. 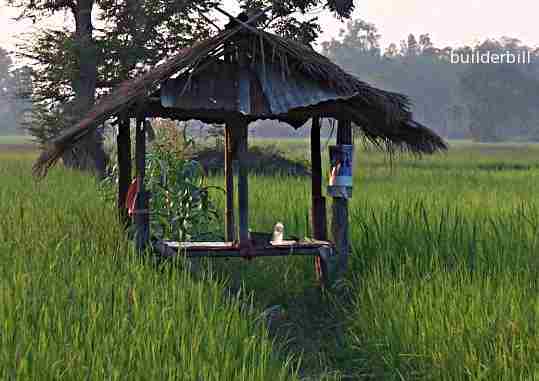 In paddy fields all over South East Asia I have seen these small roofed decks. Decks like this would have to be almost as old as civilisation itself. Yet they have the the same basics that we need of our modern designs. Space to rest and to relax after working hard. An amount of elevation to keep off the ground and to improve the view. If the climate is hot some way of providing shade. The word deck is derived from the decks of boats and for most of us a deck has to use timber or wooden boards (decking) to be a real deck. Wood or timber flooring not only looks good but it is not skid around pool decks and kinder to bare feet than most other materials. 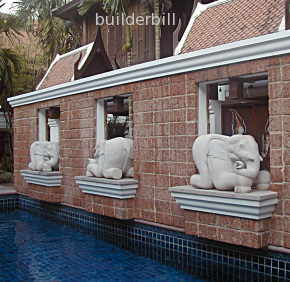 Deck ideas - Decorative sculptures to go with the general theme. Depending on the budget it is great to use a theme. 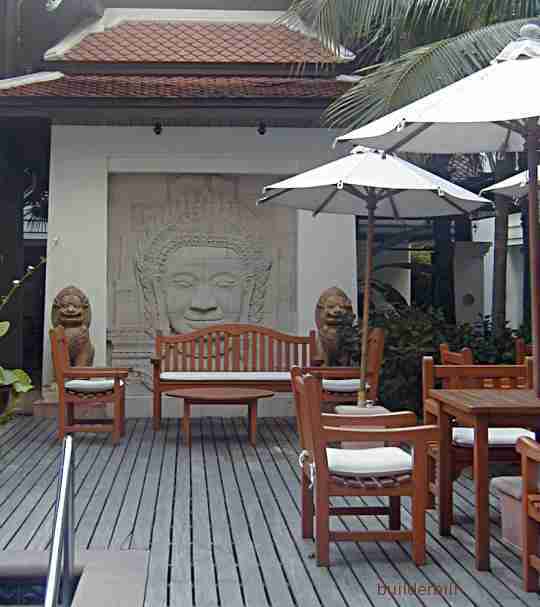 This particular one set in the middle of bustling Bangkok city, with a lush tropical garden around it may indeed be a bit over what normal folks want to spend, and I include it here to merely give you some ideas. You may be planning a trip to a foreign country or maybe you have local crafts artists that can help you to create your own personal space. The difference between a good designer and the rest of us is that they can pick accessories and use decorative effects that when placed into a quite small and mundane area; they can add a huge amount to the overall effect. In the space shown here, which is really quite small, no bigger than an average suburban back yard would look and feel fairly average with plain brick walls. Instead the designer has given it a character all of it's own. 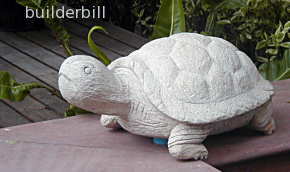 The amount of garden ornaments available and sold from garden centres is is stunning. A lot of them with a bit of thought can change the ambiance of an otherwise uninteresting area. Many times over I have seen tiny little spas and the decks surrounding them turned into truly pleasant places to relax. So to sum up, even with the smallest area and on a limited budget it is possible to have a very pleasant area with a bit of creative thought. If you live in North America you may find most of the examples I use on this site a bit outside the norm for where you live. I admit us Aussies do strange things now and again, and I know you use lumber a lot more than we do, BUT.... I have the answer for you. Here is a great deck building website run by my mate Rich. I'm sure you'll like it.